Kids don’t always enjoy the brushing and flossing process. Some simply don’t like the taste of tooth paste, others don’t like having to stop what they’re doing for a boring chore, and others just plain forget about it. Nevertheless, establishing a regular brushing and flossing routine is very important when it comes to ensuring your child’s life-long oral health. The earlier kids get into these routines, the more likely they are to stick with them, and value them, long term. 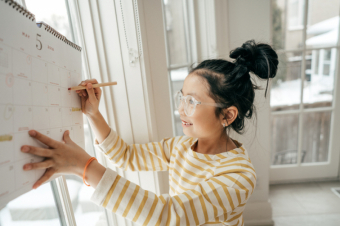 To get your kids to take a more active interest in maintaining a brushing and flossing routine, establishing a rewards and goals system can make all the difference, as it can motivate your child to stay on track. A countdown brushing calendar is an easy way to do this. This technique involves providing a reward after a designated period of regular brushing and flossing. Start by selecting a calendar to use. You can purchase a traditional calendar, print out a template, or use a digital calendar, like Google Calendar. The type you choose will depend on your child’s age. A 10-year-old may enjoy a digital calendar more, while a smaller child may like being able to colour in the days on a print out. Next, settle on a period of time that makes sense for you and your child. It can be a week, two weeks, a month, depending on the age of your child, and the type of reward you end up choosing. For example, younger children may do better with shorter periods of time, say a week. A month may seem too long for small children, and they may lose momentum and motivation before the time is up. For older children, who may only be motivated by more “valuable” rewards (in terms of time commitment or expense), longer time frames may make more sense. During whatever time period you choose, your child must brush and floss twice a day every day, to achieve the goal. Mark off the calendar after each day successfully completed. Finally, choose a reward that you child will get for successfully brushing and flossing twice daily for the full duration of the time period you settled on. The reward can be anything, and it doesn’t have to be a physical item. It could be an extra half hour of TV time before bed, a slumber party with friends, or a trip to the park. Or, you can let your child choose a small toy, add an extra few dollars to their allowance, or even donate a certain amount to a charity of your child’s choosing (you could choose a different one each time). Just be sure to select a reward that makes sense based on the time frame you’ve set up. For instance, a slumber party may not be a great choice for a weekly reward (unless you have a lot of energy! ), but it might make more sense for a monthly one. The countdown brushing calendar is a helpful way to lock down your child’s brushing and flossing routine. You don’t have to continue it forever, but I can help get your child to a point where brushing and flossing are just a non-negotiable part of their daily routine. For more advice on brushing and flossing routines for children, contact our Langley children’s dentists for a consultation.